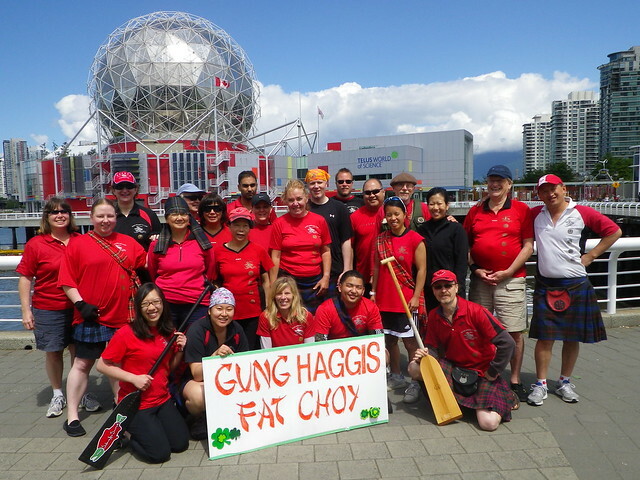 Welcome to the 2013 paddling season for the Gung Haggis Fat Choy dragon boat team. 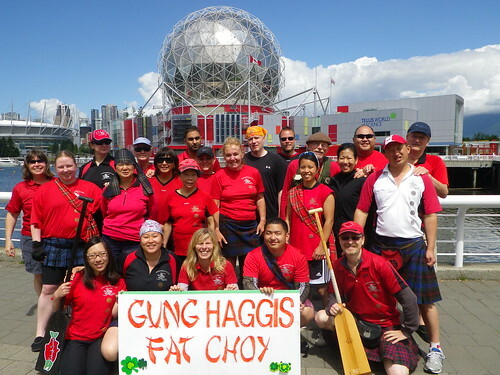 Gung Haggis Fat Choy paddlers building a big lead at the Steveston Dragon Boat Festival – 1st place in our consolation C race. We paddle every Sunday 11am -1pm (excluding holidays such as St. Patrick’s Day) and every Wed 6pm -7:30pm (starting next week). Our first practice in 2013 was on March 10th, last Sunday. 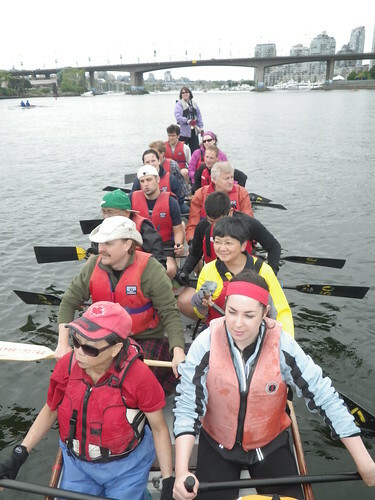 We paddle from Creekside Community Centre, at the East Bay of False Creek. 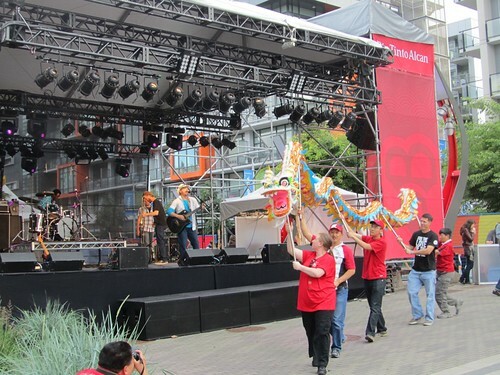 It is centrally located to skytrain terminals and bus stops. It is just a few steps southwest of Science World. 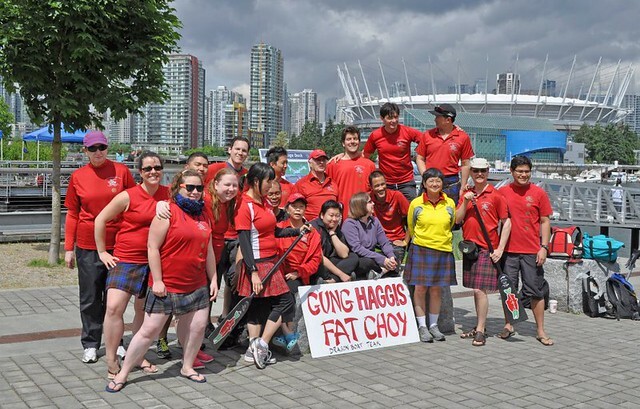 2012 was a rebuilding break through year for the Gung Haggis Fat Choy dragon boat team. 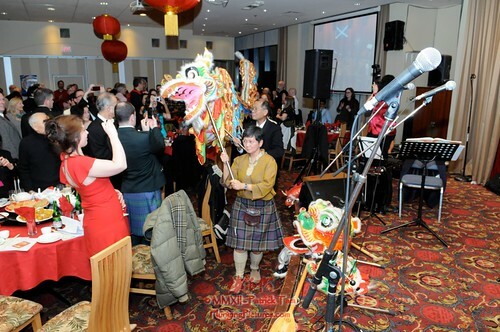 We started paddling in March, soon after celebrating our annual big Gung Haggis Fat Choy dinner at Floata Restaurant on January 27th. 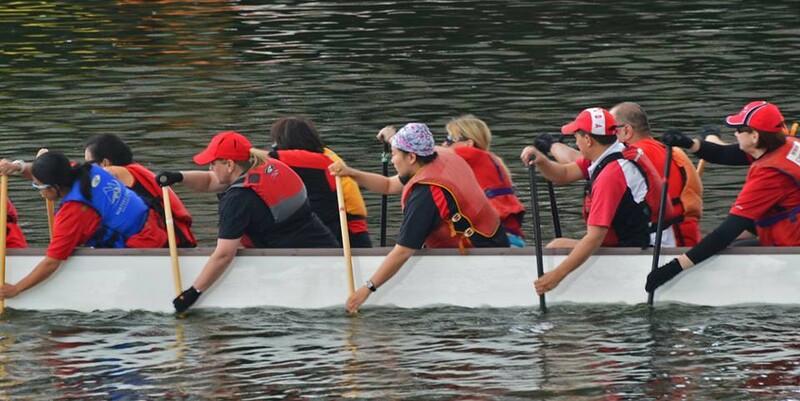 We will paddle throughout the Summer, entering races at least once a month, and finishing with one of the most fun events on Thanksgiving weekend, Saturday October 8th – the Ft. Langley Cranberry Festival Canoe Regatta. You don’t have to paddle every race. Pick and choose where and when you want to race. 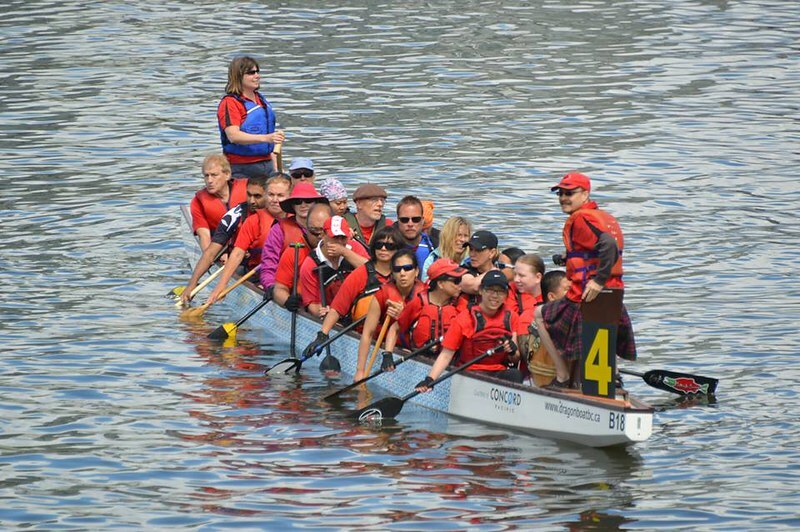 $150 Team registration includes practices, boat rental, coaching + equipment. And we have student prices! Each race event will have a varying price depending on the cost. 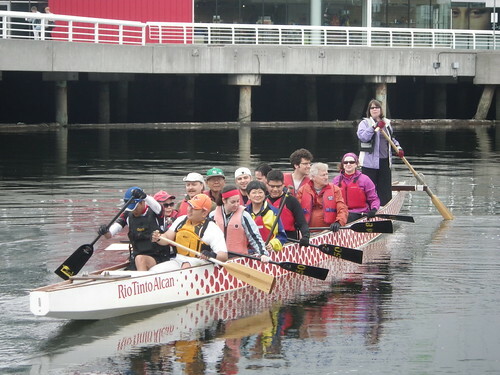 From $40 to $20, as the Rio Tinto Alcan Dragon Boat Festival team entry is $1800, RTA is 2 day event with 2 races per day + special races, one day regattas are usually only 3 races. We have really enjoyed meeting lots of new paddlers so far this Spring and welcoming back our veteran paddlers. Everybody has such a great positive spirit. 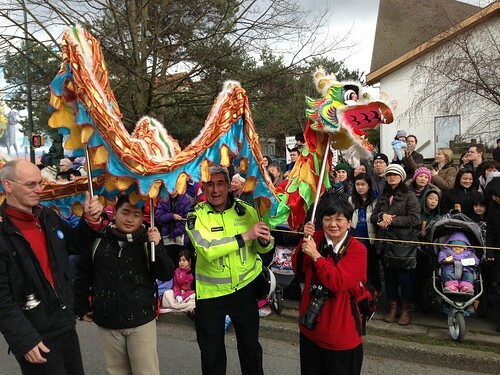 We want 2013 to be lots of fun, filled with new friendships + race results to rival last year: Our teams over 16 years have raced in Vancouver, Victoria, Kelowna, Burnaby, Richmond, Steveston, Vernon, Harrison, Cultus Lake, Ft. Langley + Banff AB, Kent WA, and Portland OR…. 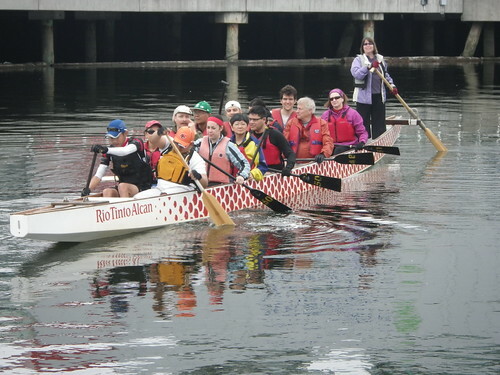 This entry was posted in Dragon Boat Information, Dragon Boat photos 2003, Dragon boat with Todd Wong - Dragon Boat Coach, Gung Haggis dragon boat team information on March 18, 2013 by admin. Leaving the dock for our 1st race on Sunday – the Rec D/E semi-final. 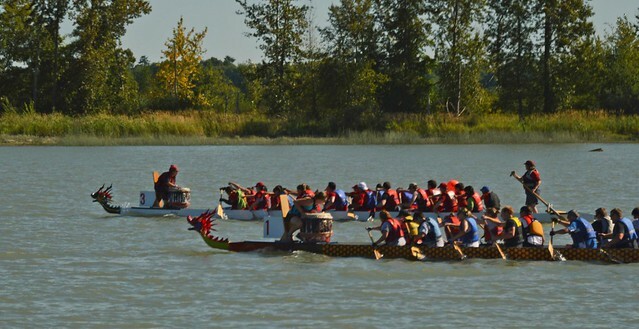 It was our 3rd race of the June 16/17 Rio Tinto Alcan Dragon Boat Festival weekend. 8th – L7/2:32.470/Dragon Zone Strokes of LuckWe came first by 4 seconds! in our final race! More stories and links to pictures later today…..
“Let it ride!” The team has just crossed the finish line in the Rec D/E semi-final. We came 3rd at 2:39.240, missing second place by 4.790 seconds. Only 1st place and the three fastest 2nd place times would make it into the Rec D medal final. While we finished in the top three of our race, it was a very messy performance. The rate was high, the timing was all over the place in the middle of the race… But we were still strong compared to the other boats in our field. We knew we were headed into the Rec D consolation race and had lots of room for improvement. We improved our race time from Rec D 2:39.240 Semi-final to Rec D 2:23.840 Final by about 16 seconds. It was the best improvement of every other team in the Rec D finals and consolation finals. Most teams improved by about 10 seconds, some only by 6 or 7 seconds. The next best improver by 14 seconds was Brittania CC Have a Nice Day which won the Rec D silver medal. The Rec D gold medal winner was Splash Test Dragons who improved by 2:19.130. All race times have variables of tides and wind, as well as heat times… but a 16 second improvement is significant!!! 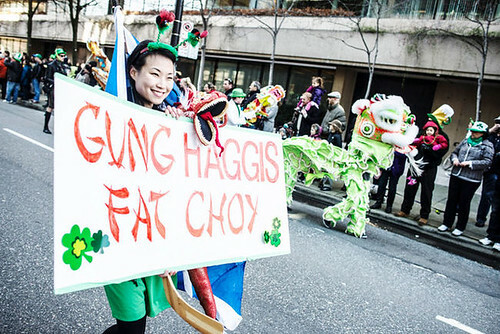 Well done Gung Haggis team!!! 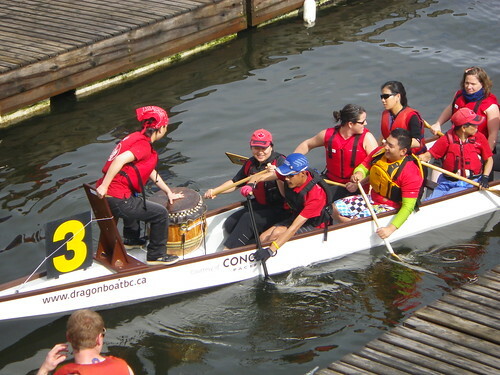 This entry was posted in Dragon Boat Information, Dragon boat with Todd Wong - Dragon Boat Coach, Gung Haggis dragon boat team information on June 18, 2012 by admin. 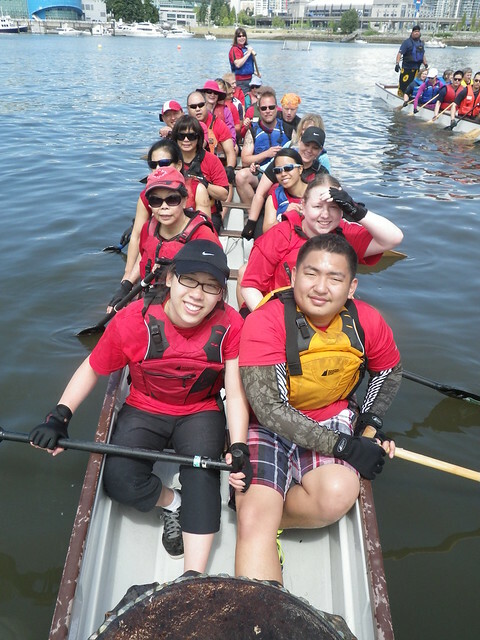 Our core paddlers have been paddling since March… and we are ready…. And we arrive on site 90 minutes prior to the race start. Sunday 1st race will depend on how we finish in our Saturday afternoon race. 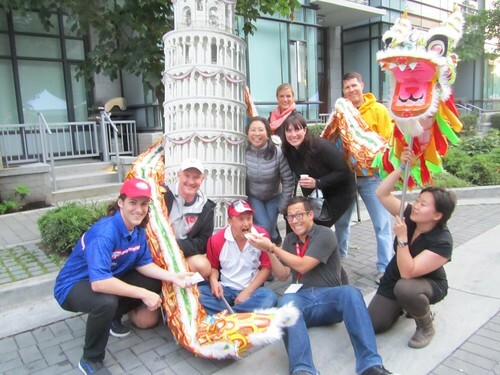 This entry was posted in Dragon Boat Information, Dragon boat with Todd Wong - Dragon Boat Coach, Gung Haggis dragon boat team information, Uncategorized on June 15, 2012 by admin. Something is happening in the water! 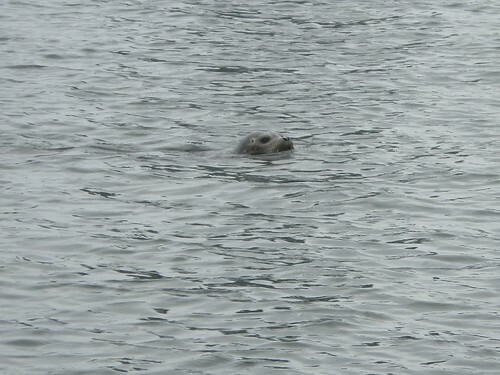 The seal swam the closest to a dragon boat that I ever saw! Deb thinks it was at least 8 feet away. 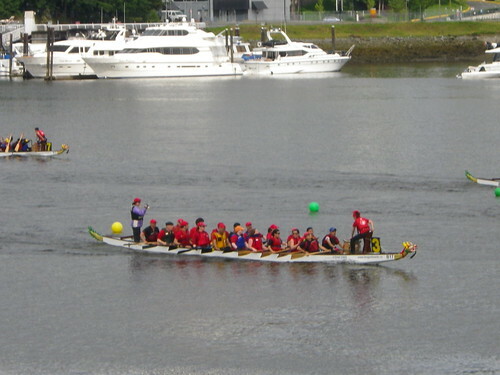 This entry was posted in Dragon Boat Information, Dragon boat with Todd Wong - Dragon Boat Coach, Gung Haggis dragon boat team information on June 12, 2012 by admin. Good practice today! We focused on race tactics as well as race day procedures. Some of our paddlers only practice on Sundays or Wednesdays, so we will do the same thing on Wednesday. After a warm-up, we explained where the team tents will be set up, and where the marshalling area will be. At last weekend’s regatta, races were 15 minutes apart. We then went through loading the boat, and how busy it will be on the dock, and leaving the docks to the race staging area on the water. We did some paddling warm-ups for rotation, hips, reach and rate, then practiced some starts, then paddled to the race staging area in East Bay. 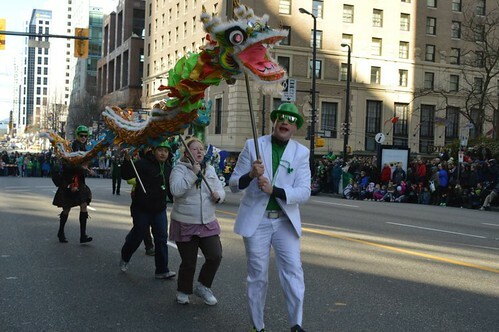 We quickly found the Hydro Dragons coached by Dan Hebert, whom I have known for about 10 years. Dan called a race start between our two boats. 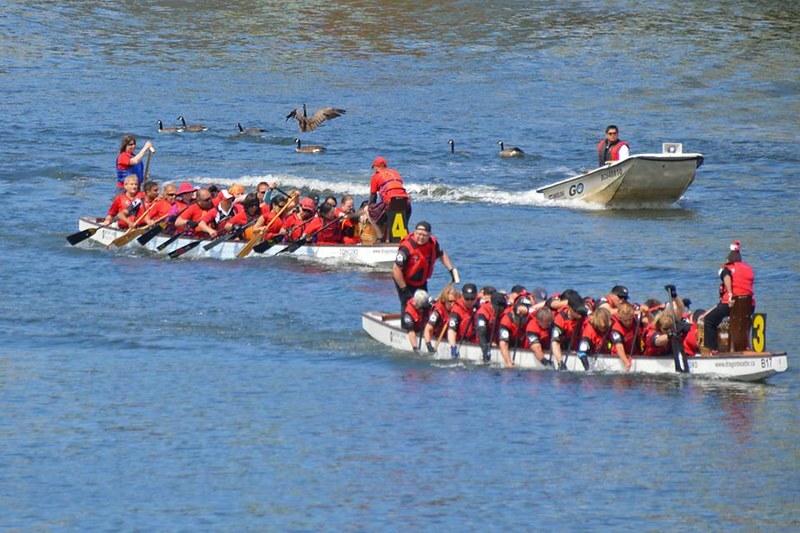 The start was close – both teams pulling hard with each stroke. 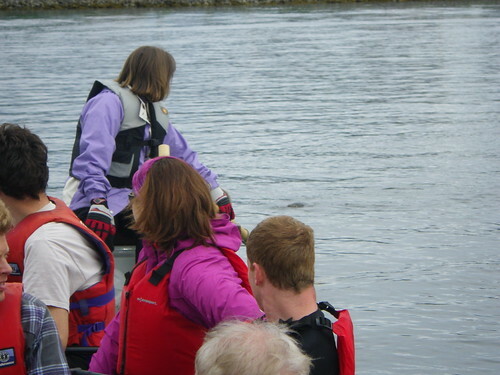 As I drummed for Gung Haggis, I stole glances at the Hydro team, watching the boat beside us. I called a Power Series, and the team responded, digging deep for 20 strokes. At the half way mark, the Hydro team pulled forward, and had to move to the left, as there was a boat anchored in the East Bay, in the middle of what will be the race course next weekend. Our boat took in some water as Dan’s coach boat cast a wake in our path. Some of our paddlers were distracted by the unexpected surprises of course change and boat wake. This is a good exercise in dealing with unexpected surprises. 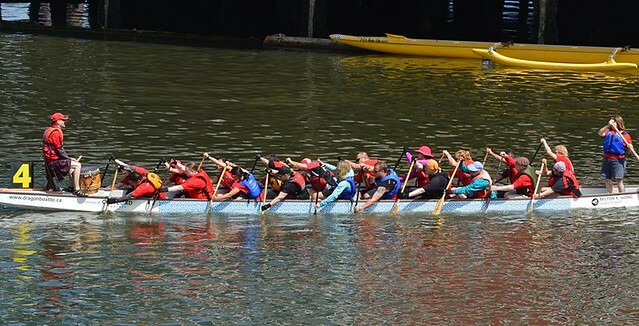 The Hydro Dragons proved to have a strong finish, and crossed the finish line before us. We congratulated them, then did our own race debrief. 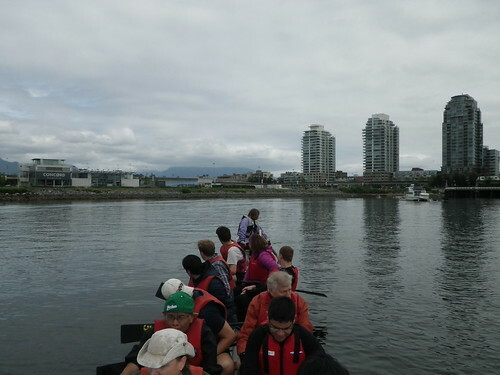 We then headed for the Center Bay of False Creek and did some exercises to help improve our race starts: front half and back half race starts. This served to show the newer paddlers how well the veteran paddlers perform, and to inspire them. The back half proved to be powerful, but with some timing issues and room for improvement. We do believe in our new padders, and want to encourage them – there is great potential here that will be realized not in the next weekend, but later this summer. We had our paddlers switch sides to work out on both sides of the body. This is something we regularly do to encourage body symmetry and help develop paddling technique for both sides of the body. We next worked on power series drills for front, middle and back thirds, while the rest of the team paddled 60% effort. 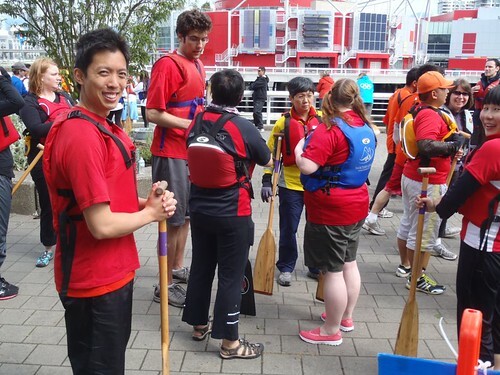 Next we turned the team over to veteran paddler Keng Graal who is also one of the team’s drummers. Keng explained how she calls for the team, and what she expects. She called a short race piece, to allow the paddlers to get used to her voice. As we approached the startline in the East Bay, beside the island, we gave the paddlers a rest, and practiced some commands for positioning the boat. We asked the paddlers to back paddle, and left front draw, right side draw – all to get the paddlers used to what may happen on Race Day. We did one final race piece of 500m, with Keng as drummer. This was good. Keng is a demanding drummer that commands attention. She first came to the team about 7 years ago in 2007. 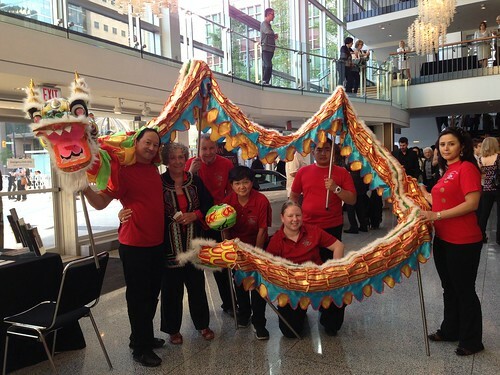 She had been a drummer for the CC Riders dragon boat team for Columbia College. We trained her to be a paddler. The first race she did with us was 1000m. She survived… She stayed with the team… and has paddled with us in many races and has really grown into a team leader. She is small, but really pulls a lot of water for her size. Everybody on this team brings something. It might be strength, experience, or a great sense of humour. 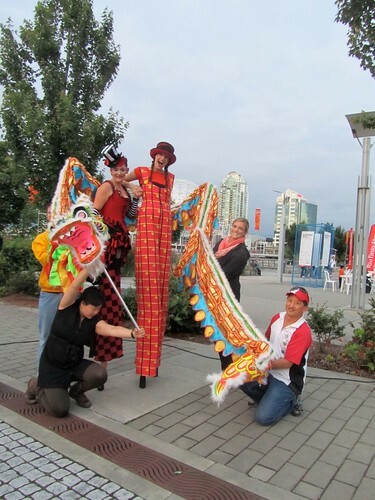 We encourage and acknowledge every person’s personality, and especially the cultural diversity that each paddler brings. We have fun and we both encourage and tease each other, as well as respect each other, and what each person brings to the team. This is good team building. This is a good team. I am having fun, and especially getting to know our new paddlers. 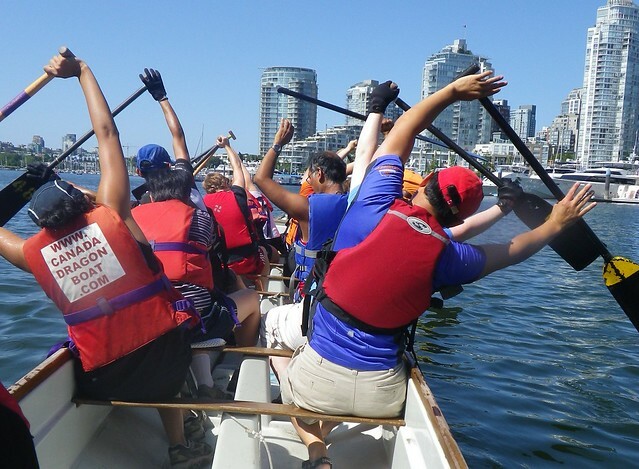 We only had 16 paddlers out on the water this Sunday – but we had fun…. and that is what is important. + Deb Martin as steersperson. 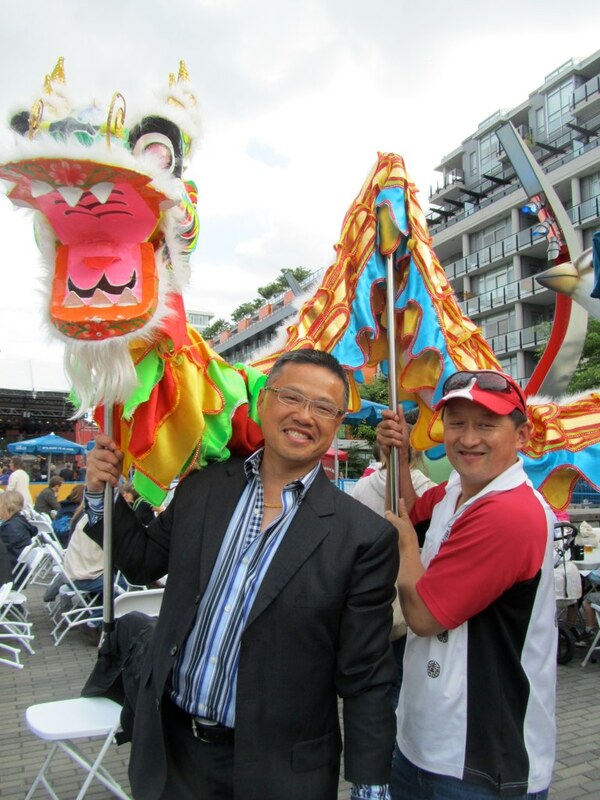 This entry was posted in Cultural Fusion, Dragon Boat Information, Dragon boat with Todd Wong - Dragon Boat Coach, Gung Haggis dragon boat team information, Uncategorized on June 10, 2012 by admin. 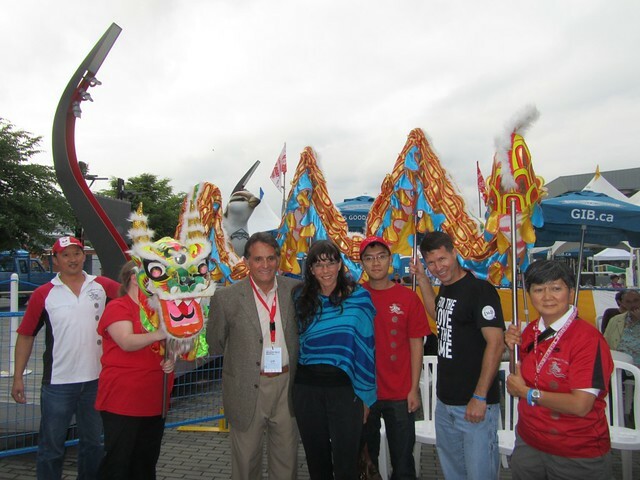 June 3rd Dragon Zone Regatta @ Creekside Community Centre. Back row: Sabina, Anne D., Karl, Pedro, Marc, Gerard, Pierce, Christian, Todd. Front row: Anne C., Jenny, Suzanne, Steven, Keng, Debbie, Deb, Gio, Caroline, Xavier, Walter. Great day of paddling for the team! We raced with 18 paddlers and focused on the development for our 5 rookie paddlers. We can see our potential as a team, as we addressed technique and rate issues… And… we had lots of fun! That is success! Congratulations to our team members. This is a video of our 2nd race. We came 3:01.430 in a Gemini boat. Marc smiles, while waiting for our 3rd race. We came 3rd in a Gemini boat with a time of 2:59.800. Hurrah, we broke 3 minutes! 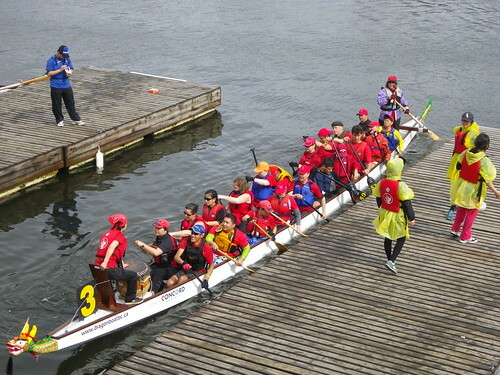 This entry was posted in Dragon Boat Information, Dragon boat with Todd Wong - Dragon Boat Coach, Gung Haggis dragon boat team information on June 5, 2012 by admin.